George Henry Cooper was born in Crewkerne, Somerset, on 19 April 1884, the eldest child of shirt cutter Henry Cooper (1858-1924) and Mary Anne née Hallett (b1860), both of Crewkerne. In the 1891 census Henry and Mary were living in Lye Water, Crewkerne, with their children; George, John (1884-1968), Daisy E (b1887) and Mary's mother, Ann Hallett. The family were at the same address in the following census of 1901 and at this time 17-year old George gave his occupation as a postman. In the autumn of 1906 George married Elsie Ellen Gooding at Yeovil. They were to set up home at 25 King Street, Yeovil, where they were recorded in the 1911 census. George still worked as a postman. They later lived at 'Devanha', 40 Sparrow Road, Yeovil. Although it is not known when George enlisted, he enlisted in Yeovil joining 8th (Service) Battalion, Somerset Light Infantry. His Service Number, 235810, suggesting he enlisted during 1915. The 8th (Service) Battalion was formed at Taunton on 20 October 1914 and came under command of 63rd Brigade, 21st Division. The battalion went to France on 10 September 1915, landing at Le Havre. On 25 September 1915, the 6th, 7th and 8th Battalions of the Somersets became embroiled in the Battle of Loos - the British Army's contribution to the major Allied offensive launched simultaneously with the main French offensive in Champagne. It was the biggest British attack of 1915. A continuous preliminary bombardment, which showered 250,000 shells on to the German defences over four days, had little real effect. Before sending in the infantry on the morning of 25 September 1915, the British released 140 tons of chlorine gas from 5,000 cylinders placed on the front line to make up for the ineffective artillery barrage. This was the first time the Allies had used the weapon, coming after the Germans employed gas to terrible effect at Ypres in April earlier in the year, and it was hoped it would annihilate the Germans at Loos. However a change in the direction of the wind at several points along the front blew the gas back into the British trenches, causing seven deaths and injuring 2,600 soldiers who had to be withdrawn from the front line. Initially the gas attack created panic among the Germans and close to 600 men were gassed. Despite the setbacks caused by the wind 75,000 British infantrymen still flowed out from the trenches when the order came. British losses at Loos were exceptionally high with 50,000 casualties, including at least 20,000 deaths. During the Battle of Loos, the 21st Division suffered over 3,800 casualties and took the rest of the year to rebuild. From July to November 1916 the battalion took part in the Battles of the Somme. On 8 July 1916 the battalion transferred with 63rd Brigade to 37th Division. The battalion next fought in the Battle of the Ancre from 13 to 18 November 1916. This was the final large British attack of the Battle of the Somme in 1916. It involved an attack on the German front line as it crossed the Ancre River, a sector of the front that had first been attacked on the first day of the Battle of the Somme without success. This was a strong sector of the German front. The first British objective involved an advance of 800 yards and would require the capture of at least three lines of trenches. The next target was the German second line, from Serre south to the Ancre. Finally it was hoped to capture Beaucourt, on the Ancre. All the early successes on the Ancre achieved was the creation of a British held salient on the Ancre, which proved to be a very dangerous area to be posted over the winter of 1916-17. 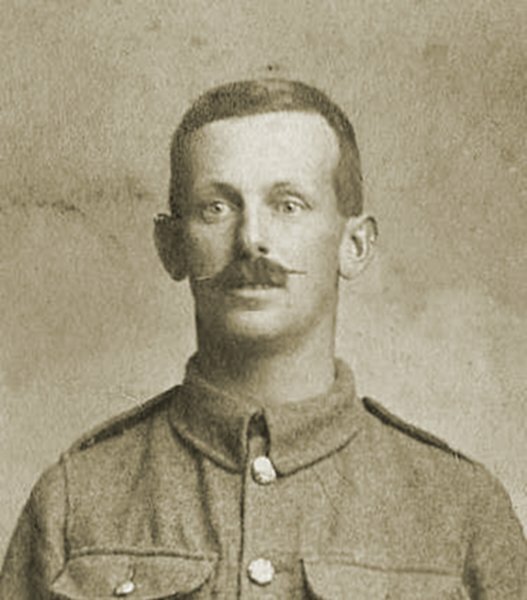 George was killed in action on 19 November 1916, he was aged 33. 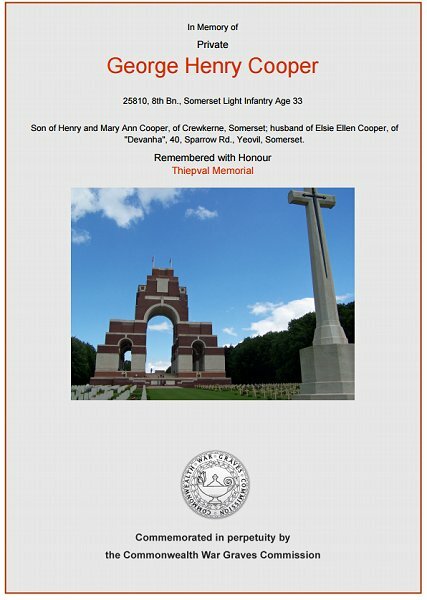 George Cooper is commemorated on the Pier and Face 2A of the Thiepval Memorial, Somme, France, and his name is recorded on the War Memorial in the Borough - albeit written as Cooper, G rather than the correct Cooper, GH. George Henry Cooper, photographed around 1915. The Commonwealth War Graves Commission certificate in memory of George Cooper.